Sjoerd De Jong or Hourences as he is affectionately monikered cut his teeth sculpting levels for the Unreal Tournament. Together with the Teotl team, he rose to prominence with The Ball and Unmechanical, and is gearing up for a new challenges as Hourence. This is his profile. Well Hourences is just me. I am Hourences. Teotl Studios is our company, and was founded in March 2010. 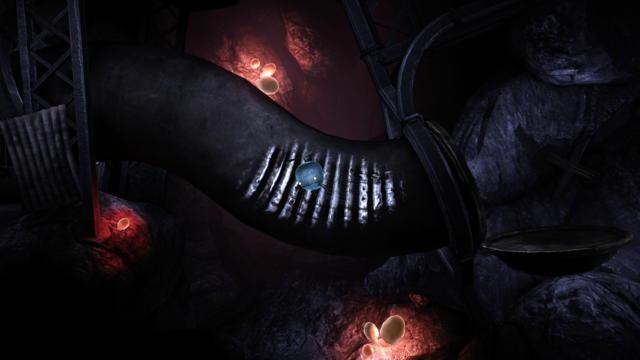 We released The Ball for PC in October 2010, and then followed up with Unmechanical for PC and iOS in August 2012/March 2013 together with Talawa Games. Teotl Studios was originally three people, but on Solus it is just me from Teotl who is currently working on it, and thus that is why it is pushed forward as Teotl Studios/Hourences. Working together with me on Solus is Wiktor Öhman, as an artist, and last week we had Bianca Savazzi join as scripter/programmer. I myself started around 1999 with making levels for Unreal and Unreal Tournament, which got me into the industry in 2003 with a contract for Epic Games, followed by contracts or employments for Guerrilla Games, Webzen, Digital Extremes, Starbreeze, Khaeon Games, and many others. I am originally a level designer, but nowadays I do a little bit of everything level/environment, effect, and scripting related. Besides my own games, I also do occasional freelance assignments in between, and I am responsible for large parts of the education FutureGames in Stockholm. How would you describe the indie scene here in Sweden? Are devs supportive to each other? I think the scene here is quite good. It helps a lot that Sweden as a whole has a big game dev community, and thrives on it. It leads to a bigger and more mature industry, which also shines through into the Swedish indie scene. You don’t have this kind and size of community, and this kind of quite high level of average professional experience in many other countries. So I think the indie scene here is definitely going strong and I am pleased with the environment it creates. How would you describe your conceptual and planning process? I work on my own or with a very small number of other people, so I don’t have a formal conceptual process. I do everything mentally within my head, and then push the product forward until it matches my vision. Solus has no concept art for example. 95% of every level and every game I have ever made was done without a formal concept process, which works best and fastest for me, though can be hard for coworkers to follow at times. Planning wise I tend to set rigid deadlines for myself and the people around me, as otherwise you run into the danger of getting stuck on a certain item forever. I am strict for myself, if I tell myself something must be done by December 1 it means I will move heaven and earth to make that deadline, even though I technically could just postpone it. What are the challenges of developing as an indie outfit? I’ve always experienced the biggest challenge to be the press and the public. Getting their attention. The market is so saturated and people’s attention spans are so short it is very difficult in my experience to get noticed. And without being noticed, you have little chance of getting sales, which in turn means no income and no future games. Like most developers I would really like to just focus on making my game and ensuring I can get that to be as good as possible within the time I have, but unfortunately there are so many other things you need to take care of all also at the same time. It is not that I don’t enjoy dealing with press and the public, it would be fun to do if I could focus on it, but having to switch back and forth between so many different tasks that is the hardest to get right I feel. Whats been a major highlight for the studio so far and what inspired the games creation? Both The Ball and Unmechanical did really well. We’ve sold over 350 000 copies of both games so far, and The Ball received PC Gamer USA Best Action Adventure of 2010 for one, and Unmechanical won Best Artistic Achievement at Nordic Games Conference. We managed to get both games out on Steam and all other major digital stores, and we even got retail going in many parts of the world for The Ball, and in Russia and Germany for Unmechanical. We also managed to get Unmechanical featured by Apple in the top banner all over the world, and The Ball was part of Valve ‘s Portal 2’s one month long Potato Sack release special. So for two games made on a shoestring budget, and with no office, I am very pleased with how things have gone so far. What is the long term goal for the studio? Long term goal is to continue as we do now. We don’t really have any plans for expansion or such, but we want to run a stable well financed business. Part doing relevant freelance assignments, (in my case) part continuing to run FutureGames, and part creating our own games. That gives a very pleasant diversity, and provides safety nets in case one of those things fail or don’t deliver as expected. Who are the developers in Sweden and the Nordic region that have been role models and inspiring figures? There are so many studios and people who are so good at what they do Scandinavia I honestly can’t pick one specific person/company. For more on Hourences, visit the website.